Providing Internet access in public areas is not the same as providing Internet access in homes or offices. Public Internet users come and go in masses, which makes access management and preventing bandwidth abuse especially challenging. The anonymity of public users makes it especially challenging to retain user data for legal purposes. Without the right Internet access solution, there is no way for public areas or venues like hotels to provide high-quality but controlled Internet access, let alone generate revenue from Internet services. 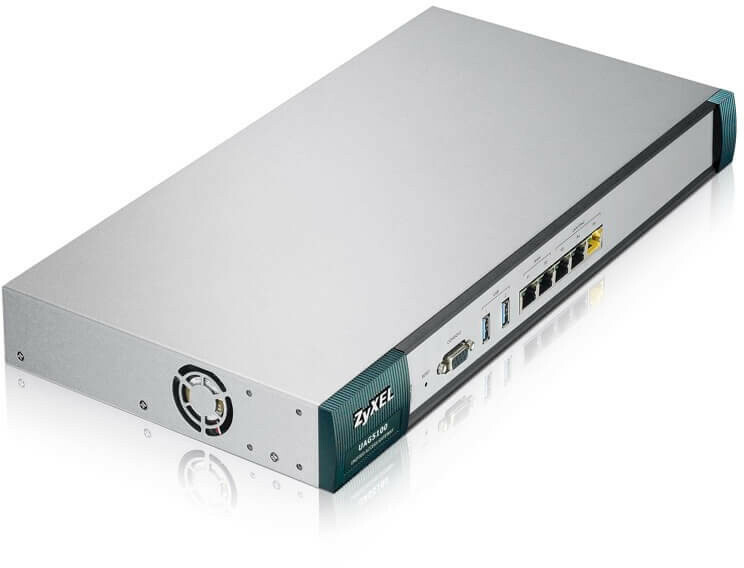 The Zyxel UAG5100 is a high-performance access gateway designed to manage guest access and generate revenue in public Internet access networks. Supporting up to 800 concurrent logins, the UAG5100 is perfect for medium-sized venues like hotels, convention centers or public libraries. It facilitates compliance with data retention laws, and ensures high-quality, always online Internet access with dual-WAN and per account bandwidth management capabilities. 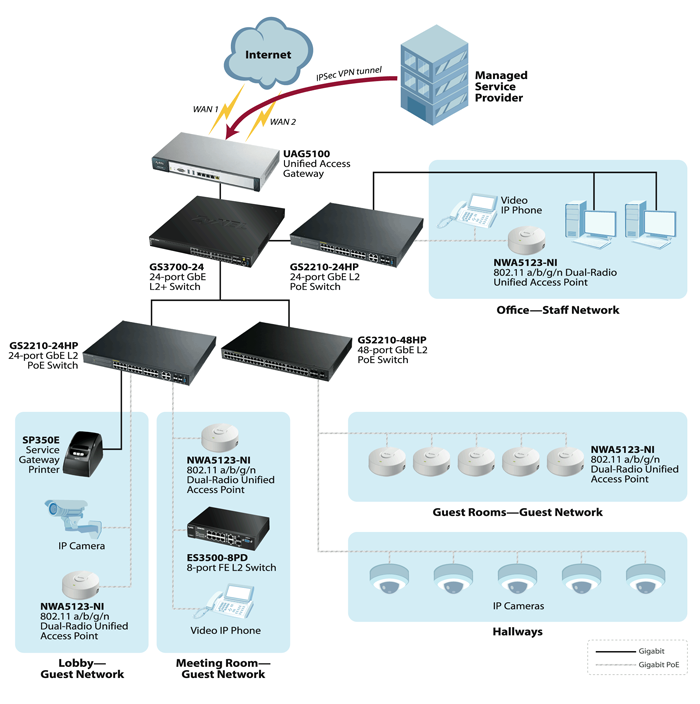 It also reduces hardware expenditure for BYOD deployments with a WLAN controller built-in. The Zyxel UAG5100 has the capacity to provide public Internet access to hundreds of users in medium-sized venues like hotels, libraries and convention centers. It supports 500 concurrent logins by default, and up to 800 via license upgrade. With dual-WAN support and per account bandwidth management, the UAG5100 maximizes Internet uptime and optimizes access quality to keep customers and visitors satisfied. 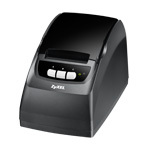 The Zyxel UAG5100 is designed with advanced billing, user authentication, and access control features that help organizations like hotels manage guest accounts, block unauthorized access, and generate revenue with Internet services. It facilitates monetization of networking investments by offering Internet access as a paid service, or a free service with limitations and premium when a purchase is made. The Zyxel UAG5100 delivers Internet services with reduced capital and operational expenditures. Without additional hardware investments, the UAG5100 can scale up to 800 concurrent logins, and manage up to 32 APs with the integrated WLAN controller. The WLAN controller increases administrative efficiency with a centralized interface for AP management. The UAG5100 also offers ten (10) IPSec VPN tunnels that make it easy for MSPs to manage the gateway remotely. No longer do organizations that provide public Internet access need to worry about fines nes that come with not being able to comply with data retention laws, like the EU Data Retention Directive (2006/24/EC). The Zyxel UAG5100 has data retention functions that automatically retain Internet usage records for government auditing when required. The UAG5100 is designed to provide controlled network access to hundreds of guests in medium-sized venues like hotels or public libraries. It supports 500 concurrent logins by default and up to 800 concurrent logins with license upgrade. The UAG5100 features a captive portal and a built-in account generator that can manage 300 static accounts and up to 4,000 dynamic accounts. External RADIUS servers and external portal page redirection is also supported by the UAG5100. The UAG5100 supports up to ten (10) pre-paid billing plans. Billing plans can be customized with varying bandwidth speeds, service duration, and level of payment. Credit card billing is also available via PayPal. The UAG5100 supports SMS ticketing via ViaNett and up to ten (10) SP350E printers. The SP350E enables one-click billing and account generation, and supports group ticket printout of up to 50 tickets at a time. The UAG5100 provides non-stop Internet uptime with dual-WAN support. Dual-WAN works with two Ethernet WAN connections for active-active load balancing or active-passive failover. The UAG5100 helps hotels ensure customer satisfaction with quality Internet services. It features per account bandwidth management to enforce equal bandwidth sharing and avoid bandwidth abuse. The integrated WLAN controller supports CAPWAP, and enables centralized authentication and access management of multiple APs in the network. The UAG5100 can manage 16 APs by default, and up to 32 APs with license upgrade. The UAG5100 features a special Powered Device (PD) design that enables it to be powered by an IEEE 802.3at PoE switch. Users can do without a power adapter by powering the UAG5100 via the P5 LAN/DMZ port (yellow). 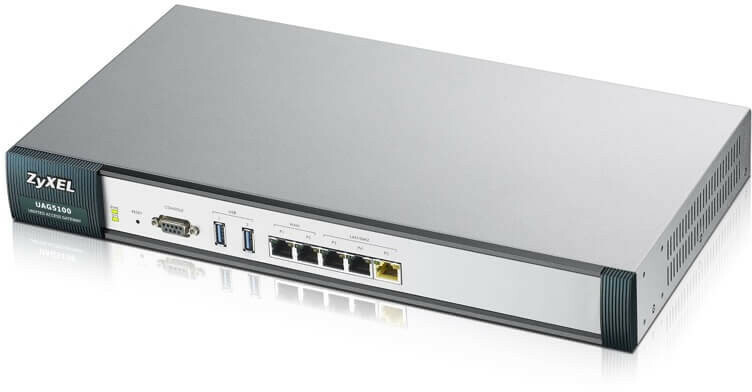 Deployed with a syslog server, the UAG5100 can automatically record user account information, MAC addresses, source and destination IPs, data volume and protocol type to comply with data retention laws like the EU Data Retention Directive (2006/24/EC). The UAG5100 provides ten (10) IPSec VPN tunnels to make it easier and more efficient for MSPs (managed service providers) to remotely manage and service the UAG5100 installed at the customer premises. 100 - 240 V AC, 50/60 Hz, 0.6 A max. Download the Zyxel UAG5100 Series Datasheet (PDF).